I’ve been meaning to review Judy and Dagmar Jenner’s book The Entrepreneurial Linguist: The Business-School Approach to Freelance Translation since before this fall’s ATA conference…fortunately I took notes when I read it over the summer, so here we go! The Entrepreneurial Linguist is available from Lulu Press for $25.00 (paper copy) or $17.00 (file download). Judy and Dagmar Jenner co-wrote the book, which includes illustrations by Alejandro Moreno-Ramos of Mox’s Blog fame. 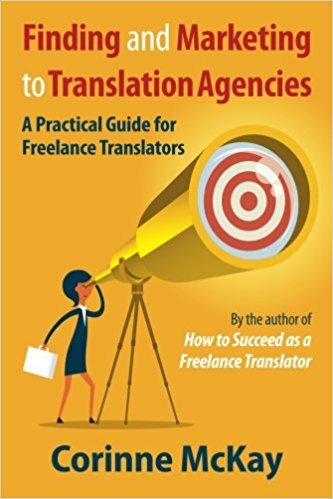 Its 11 chapters cover business skills for intermediate to advanced freelance translators and the book’s focus is on running a freelance translation business as a business rather than as a money-making hobby (excellent advice!). I highly recommend this book, largely because it is light on theory and heavy on nuts and bolts tips that the reader can apply immediately. For example, the section on tradeshows includes a checklist of ways to connect and follow up with potential clients who are tradeshow exhibitors. Likewise, the marketing chapter lists typical reasons why a translator might lose clients, and offers tips on how to avoid each of these reasons. As an added bonus, most of the chapters include business school-style case studies that illustrate how the book’s concepts can be applied in real-life freelance business situations. Judy and Dagmar also do a great job of dispelling the negative and self-defeating ideas that many translators have about direct client marketing. In a great section called “Yes, you can!,” they chip away at the typical marketing excuses that many translators make: I’m too busy, I already have enough work, direct clients are too demanding, I don’t know where to start, etc. While emphasizing that finding well-paying direct clients is not easy, the authors prove that marketing to direct clients is mostly a matter of getting out of the translation industry, going where your potential clients are (online and in the real world) and positioning yourself as a trusted authority. Although I’ve been in the translation industry for nearly a decade and wrote a translation business book, I’ve found myself referring to The Entrepreneurial Linguist on a regular basis ever since I read it. Judy and Dagmar are staunch advocates of charging what you’re worth, finding clients who value your work and giving your clients a very high-quality product: even experienced translators can’t get too much of this message! The only points I found myself disagreeing with are Judy and Dagmar’s selection of Facebook as the most valuable social networking site for freelance translators (I like it for personal use and I think it’s great for event-based businesses but I’d go with LinkedIn or Twitter for professional use) and the fact that the book doesn’t have an index. However, the table of contents is very thorough and it’s not hard to find the section you’re looking for! In conclusion, I would highly recommend The Entrepreneurial Linguist for freelancers at all levels, especially intermediate and advanced freelancers who are looking to move into the direct client market. Judy and Dagmar also have a great blog, Translation Times, and you can follow them on Twitter at language_news. Excellent article, Corinne! Your points addressed many of the issues I’ve been wanting to explore (trade shows as a marketing tool) or overcome my worries about (direct client acquisition), so I’m off to order this book. Thanks for the helpful – and well-written – information! A good review of a great book. The index issue doesn’t bother me; much as I like paper books, I got the PDF copy of theirs so I could keyword search it. And I agree completely that even when you are well aware of a point like charging appropriately, you cannot hear certain messages enough. The destructive contrary messages are all to common, often masquerading as “professional wisdom”. Judy and Dagmar are offering the real stuff. Thanks for this great review, Corinne. Of course we are very flattered that we can teach someone as highly experienced as you a thing or two. Good point on FB – since the publication of the book, we’ve become more involved in Twitter, but for some reason or another, FB has been a great marketing tool for us, which might not be typical. However, it’s become clear that Twitter outperforms FB. Thanks for the note on that; we might elaborate on that in the second edition. Excellent review of an excellent book. I believe your book and the Jenner twins books will become one of the industrys go to’s. Thanks for listing points that makes me want to go back and reread the book again. I agree! This book is excellent in so many ways! I just finished it myself. After having turned from freelancer to small business owner of an LSP last year, I found this book, as well as Judy’s articles in the Chronicle to be extremely helpful and insightful. I would recommend this read to anyone who is thinking of delving deeper into the world of freelance translation. The book is an easy read, and I found myself constantly making small notes to myself (not to mention that my “To do” list has grown quite a bit as a result of reading it!). Wonderful book!! And wonderful review! Nice review, great book! The Entrepreneurial Linguist is also available through the ATA website. Members $25. Non-members $35. Free shipping in U.S. Thanks everyone for your comments! And big thanks to Judy and Dagmar for writing this helpful book; I use it in my own work with marketing to direct clients. Looking forward to the second edition too! I enjoyed your article. I’ll show it to mi curso de traducción mates. I have specified this excellent book as course litterature in my course of translation at the University of Stockholm this semester!